The scene won’t soon be forgotten. 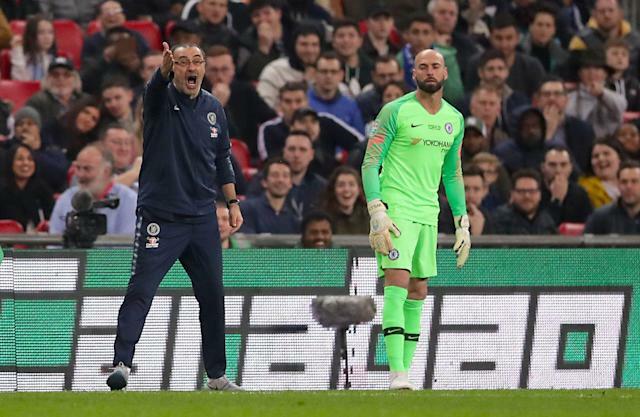 On Sunday, Chelsea manager Maurizio Sarri attempted to substitute his goalkeeper as the deadlocked League Cup final against Manchester City was running out of extra time and quite clearly trudging into a penalty shootout. Kepa Arrizabalaga, the world’s most expensive goalkeeper since his summer arrival from Athletic Bilbao, but often an unconvincing one this season, waved off his irate Italian manager in increasingly insolent gestures. Willy Caballero, the mooted replacement, preferred in this situation on account of his knack for saving penalties, stood along the sideline, not quite sure what to do with himself in the face of such naked insubordination by his fellow goalkeeper. Eventually, Sarri, who has come under real pressure during his first season in the English capital, caved. Caballero sat back down. Kepa stayed on. Sarri briefly looked like he was walking down the player tunnel and away from the field, before changing his mind and turning around. Kepa saved one penalty kick from Leroy Sane but let a bad effort from Sergio Aguero slip under his hands when he should have parried it. And so City won the cup. By a single penalty kick. 🙈 - Not what Kepa Arrizabalaga would have wanted in the penalty shoot-out after his bust-up with manager Maurizio Sarri! After the game, Sarri called the whole thing “a big misunderstanding.” He attempted to explain it all away by saying he thought Kepa had a cramp and needed to be substituted but was then convinced that all was fine. 👏 - Maurizio Sarri discusses the incident involving him and Kepa Arrizabalaga in today's @Carabao_Cup final. A classy response after being undermined by a player, but where do @ChelseaFC go from here? Yet Kepa’s apparent mutiny – because who do they really think they’re fooling? – committed in the brightest of spotlights in a cup final at Wembley instantly sparked outrage. The consensus more or less boiled down to Kepa needing to be benched for a very long time, if not forever. As for Sarri, all agreed that he’d been badly undermined, and that he might not come back from this very public loss of face. But the poignant part in all this is that a very credible 0-0 tie for a Chelsea team that had been in a tailspin, with some momentum finally turning in its favor, was entirely undone by the episode. After three losses in four Premier League games, including staggering 4-0 and 6-0 away defeats at Bournemouth and City, Chelsea slipped to an intolerable sixth place. Sarri badly needed the positivity from playing the very team that had delivered Chelsea's latest humbling to a deserved tie over two hours. That it won’t get to profit from this performance is the upshot of Chelsea’s own dysfunction. Let’s assume that Kepa is lying and really did go against his manager. And even if he wasn’t, the dynamic between the all-powerful players and the 14 disposable managers the club has swirled through in the last 12 seasons is such that it’s telling in its own right that nobody really doubts what happened. The players at Chelsea seem to know that they have more clout with upper management, consisting pretty much entirely of owner Roman Abramovich and chief executive Marina Granovskaia, than their transient managers do. If they dislike the guy ostensibly hired to lead them, all they have to do is let the results slip and they’ll get someone else. That may not be what’s happening here, but it’s happened before. With heavyweights like Jose Mourinho and Antonio Conte, no less. And even if the ongoing sporting crisis isn’t maliciously manufactured or indeed a rebellion against Sarri, the culture nevertheless persists. The players are in charge. And it’s not like Sarri has been fully empowered to succeed anyway. The biggest club, by far, that he led before Chelsea was Napoli – a popular and respected outfit, but not in the Londoners’ stratosphere. Chelsea grew intoxicated with the dazzling attacking soccer – “Sarriball” – Napoli played and lured Sarri to Chelsea, expecting the same sort of playing style, only without giving the new manager more than a small handful of the very specifically skilled players he would be needing. At any rate, the whole Sarri experiment has wound up a muddled mess. It all speaks to the short-termism that’s tripped Chelsea up again and again in recent years. An owner with an itchy trigger-finger was probably never going to allow Sarri the time he needed to fashion the sort of team he hired him to build. And now it’s fairly unlikely that Sarri will be around next season, sending the club careening on to its next managerial mini-era.